Sony has launched three new AV receivers in the UK this week, from the entry level STR-DG520 through to the midrange STR-DG720 and the high-end, high-performance STR-DG820. 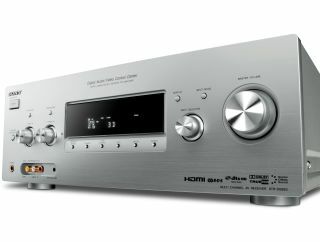 All three of Sony's new receivers support 1080p 24fps True Cinema, while the range-topping STR-DG820 brings full HD audio capability to even more users thanks to its onboard Dolby True HD/DTS Master Audio decoders, now available at a lower price than ever before ($400 US, with UK pricing still to be confirmed by Sony at time of going to press). Sony's just-in press release informs us that: "All three receivers also offer a host of features to make them easy to install and integrate into complete home entertainment systems, including Digital Cinema Auto-Calibration for simple, accurate automatic set-up, Digital Cinema EX processing for more immersive surround effects and Sony's DM Port for fast hook-up of portable and personal music players, wi-fi networks and Bluetooth." The STR-DG820, STR-DG720 and STR-DG520 will shortly be made available from Sony Centre stores and online at the Sony Style shop.